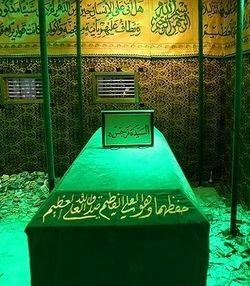 Tomb of Narjis (a) Khatun in Samarra. Photo by: Hamed Malekpur/Fars. Narjis (a) (Arabic: نرجس) is the name of Imam al-Hasan al-'Askari (a)'s wife. She was the mother of Imam al-Mahdi (a). She was also called: Malīka, Rayhāna and Sūsan. al-Mas'udi is the first historian who has reported about the mother of Imam al-Mahdi (a). According to his report, Imam al-Mahdi's (a) mother was a slave woman named Narjis (a). Al-Shaykh al-Tusi narrated a hadith which says that her name was Rayhana but it follows that she was also called Narjis (a), Sayqal and Susan. Al-Shahid al-Thani has reported from an unknown source that she was Maryam bt. Zayd al-'Alawiyya. In the narration of Hakima, which is the most famous and reliable narration about the birth of Imam al-Mahdi (a), she was called Narjis (a). It is possible that her original name was Narjis (a) and the other name except for Sayqal was given to her by her lady, Hakima, the daughter of Imam al-Jawad (a). People of that time called their servants by various names for optimism. Narjis (a), Rayhana and Susan are all flower names(daffodil, basil and lily). The first narration about her nationality goes back to 286/899. Al-Shaykh al-Saduq is the first scholar who brought up this topic. According to this narration, she was a Christian from Roman Empire who was captured by Muslims. Nakhkhas –one of the companions of Imam al-Hadi (a)- bought her from the slave market in Baghdad and sent her to Imam al-Hadi (a) in Samarra. However, this narration loses its authenticity afterward and looks more like a fairy tale. It continues that the mother of twelfth Imam was Malika bt. Yusha' the grand-daughter of Caesar from his daughter, and her mother was a descendant of Simon, the disciple of Jesus (a). When Malika was in his grand-father's palace, she dreamed lady Mary (a), Jesus's mother, and Lady Fatima (a), the Prophet's (s) daughter. Lady Fatima (a) invited her to embrace Islam and convinced her to let herself to be captured by Muslims. Authenticity of this narration have been questioned from several aspects. The most dubious point is the last part. First, there was no major conflict between Abbasid and Romans after 242/856-857 and there is no report in the sources that the Roman Emperor asked Abbasid to free her grand-daughter. Second, early authors such as al-Qummi, Nawbakhti, al-Kulayni and al-Mas'udi who were contemporaries of al-Shaybani - the narrator of the hadith - did not mention this hadith in their works. Also, al-Kashshi, who was acquainted with al-Shaybani, asserts that he was from Ghulat. Third, al-Kulayni reported that Imam al-Mahdi's (a) mother was a slave woman from Nawba, northern province of Sudan. Additionally, al-Nu'mani and al-Saduq have narrated other hadiths which say that she was a black slave woman. But why later Shi'a scholars ignored these hadiths and believed that al-Shaybani's hadith is authentic? It is possible that it was because his hadith implies that Imam al-Mahdi's (a) mother was from a noble family with a high social rank. Also, the relation between Imam al-Mahdi (a) and Jesus (a) in this hadith fascinated them, because there are some hadiths from the Prophet (s) which imply that they both rise up together and save the world from injustice and tyranny. According to the three previously mentioned points, one can reject al-Shaybani's hadith; although al-Shaykh al-Tusi and Ibn Rustam al-Tabari authenticated it. Apparently, al-Shaykh al-Mufid has narrated a sahih hadith about the mother of Imam al-Mahdi (a). He narrated: "she was a slave women who was brought up in the house of Hakima, Imam al-Hadi's sister, and when Imam (a) saw her face, foretold that she will bear a child by the special blessing of God." According to al-Shaykh al-Saduq, she passed away before 260/874. But according to al-Najashi, she was alive after this year and hid in the house of Muhammad b. 'Ali b. Hamza who was a close companion of Imam al-'Askari (a). The material for writing this article has been mainly taken from نرجس خاتون in Farsi wikishia. This page was last edited on 6 August 2018, at 08:41.